Warning: An image of the controversial cover appears below. Charlie Hebdo unveiled the cover illustration for its first issue following last week’s deadly attack on the magazine. 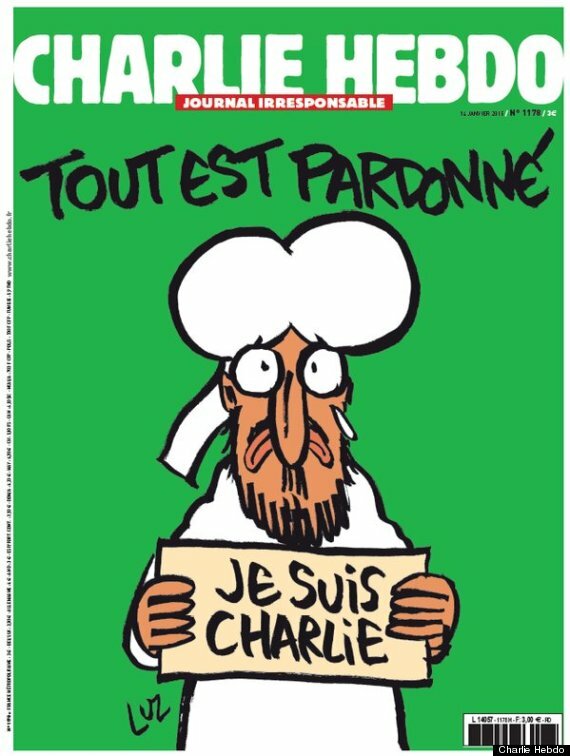 The cover, for what is being dubbed the “survivors’ issue,” features an image of the Prophet Muhammad holding a “Je Suis Charlie” sign. The words “Tous Est Pardonné”—”All Is Forgiven”—hang above. A tear is falling from his eye. “We don’t feel any hate to them,” cartoonist Zineb El Rhazoui, who survived the attack and worked on the new edition, told the BBC, referring to the terrorists. “We know that the struggle is not with them as people, but the struggle is with an ideology.” Asked if the cover might alienate Muslims who have spoken out against the violence and in support of the satirical magazine—after all, Islam prohibits the portrayal of Muhammad—she said that Islam ought to be treated like any other religion and that anyone who is offended need not buy the issue. Charlie Hebdo had an equal opportunity policy when it came to giving offense, but in recent years it had come to lean heavily on jokes about Muslims, who are among the most vulnerable citizens in France. Assia [a pseudonym Shatz refers to in his piece] does not believe in censorship, but wonders: “Is this really the time for cartoons lampooning the Prophet, given the situation of North Africans in France?”…If France continues to treat French men of North African origin as if they were a threat to “our” civilisation, more of them are likely to declare themselves a threat, and follow the example of the Kouachi brothers. This would be a gift both to Marine Le Pen and the jihadists, who operate from the same premise: that there is an apocalyptic war between Europe and Islam. We are far from that war, but the events of 7 January have brought us a little closer. The issue is set for release January 14, with an estimated 3 million copies being printed. The normal circulation for the magazine has been 60,000. Update, January 14, 2015, 8:50 a.m. EST: After copies sell out in France, Charlie Hebdo raised its print run to 5 million.